Keep your elbows down! Keep your wrists bent! Bend your knees! Plant your heels in the ground! If you were to embody these things without the viola you wouldn’t look or feel very natural, yet when we bring the viola into the picture, these things all make sense to us. Why? Other than pure brainwashing from our teachers, we are always (at least we should be) looking for a beautiful sound; and we will try anything, and I mean anything, to get it. Well, you might ask: Isn’t playing the viola all about the sound and the music? Don’t I need to make a good sound? What’s your point? My point is, when we get caught up in listening to our sound or “making” music, we often forget about the body entirely. Once we bring the bow to the string and begin to play, no matter what we do (or don’t do), it is our individual interpretation. Trying to make it our own becomes redundant; we are already playing, who else could it be? Even if you use your teachers markings for bowings, fingerings, etc., in the end it is you on stage not your teacher. Your incorporation of the teacher’s musical ideas does not remove your personal stamp. If you mimicked everything your teacher did, it is still filtered through your mind-body, therefore becoming yours. This doesn’t mean discredit the teacher or that a teacher can’t help us find our individual sound (quite the contrary). However, “our sound” is something that, in its purest form, is found, not created. Our sound in inherent, it is what comes out when we play. When we remove the blockages of energy in the body our pure sound and ideas are free to emerge. A very good example of this is when we play friend’s/colleague’s instruments. I have often gotten the comment, “Your viola doesn’t sound very different than xyz person’s viola.” I sound like me, regardless of the viola and so do you. So you are saying that I shouldn’t try? That makes no sense. I got where I am in life by trying hard in the things I do. That is why I am successful! If you want to understand this idea you first must examine the word try, and I don’t mean look it up in the dictionary. Ask yourself: what does it mean to try? What motivates you to try? Use it in a sentence as you normally would. It is incredibly important to understand what words mean to us, not just what some scholar decided they mean, although it’s usually helpful if the definitions line up. For me. to try means: to attempt to do something/do something that I am not sure of/familiar with. i.e. : I’m going to try to play a new concerto, I’m going to try to snowboard, I’m going to try xyz food that I’m not familiar with. Trying implies a journey into the unknown. Here it is helpful to define learning, again this is my personal definition: learning is moving from the familiar to the unfamiliar and back again, or put another way, letting ourselves become acquainted with the unfamiliar. If you already knew how to perform xyz activity you wouldn’t have to try you would simply skip to doing (just do it). i.e. : I am going to play the Bartok, snowboard, and eat pizza. For learning to occur you must try, however, once you have become familiar with the activity there is less of a/no longer a need to try (experiment). If you have ever felt a quasi-out-of-body experience while performing, for example: feeling the fingers moving “with a mind of their own,” that was doing without trying (or in Alexander Technique jargon: non-doing). This only happens with pieces we are very familiar with. If you began trying while in this state of “non-doing doing” it would likely result in a train wreck (or train of thought wreck). When I first had this experience, I was afraid. I watched my fingers and bow moving, I watched the notes go by on the page as if I had entered the piece into a computer; all the time thinking, “God, I hope this keeps going to the end of the movement, I hardly know where I am!” This thing that had taken over didn’t feel like me. Was I possessed by the composer for a brief period? Who was playing? This unfamiliar me was my body. After weeks and months of preparation your body learns the intricate movements, like steps to a dance, of the piece you are playing. It has them memorized. The need for your conscious self to mirco-manage the movements is gone because the music has been embodied. The body has an innate intelligence which is not under our direct control, however we influence it indirectly through our thoughts constantly. When the body’s intelligence is well organized and not interfered with you can achieve the effortless flow described above. However, when the running commentary in our heads enters into the picture, such as the fear of losing one’s place on the page during a performance in the example above; the possibility of effortless flow of movement and thought can be, and often is, overcome by our fight or flight (startle) response, effectively slamming on the muscular and mental brakes. Most people are unknowingly in a constant variation on the startle pattern (head and limbs pulled into the torso like a turtle going into it’s shell). One of the reasons for this is that most people’s typical response to want and desire is to create tension by throwing more energy at the problem. I observed a beautiful example of this in a border-collie named Fluffy. If I spoke her name she would be filled with the desire for petting/attention like most animals, including us! She would quiver with energy, her muscles activated by this desire. If you withheld the petting what happend? Her desire for petting became greater until she couldn’t stand it anymore and she left her comfortable position to further insist on attention. In Fluffy’s case this is fine; if you ignored her long enough she would eventually let go of this excess tension by giving up the desire for attention (a form of inhibition). However, Imagine if Fluffy was unable to eventually give up the desire for attention. Her muscular response would be constant. Most musicians and people in general are in this constant state of want, desire, and tension. Like Fluffy, if the want/desire is not met, the tension becomes greater. Unlike Fluffy, most people lack the ability to let go, and the problems they face are more complex than walking across the room! Like want and desire, every thought that enters your head has a physical and emotional response. Therefore thought is action, or at the very least thought initiates action. i.e. : you are angry and clench your jaw, you are happy and smile. “I missed the shift” (fill in a typical thought/physical/emotional response you might have here) “I didn’t get the job” (________). Once you gain the ability to inhibit (pause, say no to your habit, and choose a different option) your physical and emotional responses to stimuli, you can begin to differentiate between real thought and the running commentary in our heads. Essentially, the running commentaries in our heads are habitual mental reactions to stimuli. The stimuli can be internal or external. These reactions are usually deeply interwoven with our belief systems (how we have decided to view the world). It is important to remember that emotions, and other parts of the body can create thought, albeit sometimes illogical thought; the relationship is not a one-way street. “I’m hungry, sad, angry, in love, in pain, happy, etc.” What we experience as the mind (pre-frontal cortex), body (reptilian brain & nervous system), and emotions (limbic brain) work as a whole, they are literally connected of course, to create our version of reality (perception). For more on this see my post Perception & Reality: A two way street. Now, think about how badly you want to play beautifully; how badly you want to be a successful musician. Those wants and desires give us the motivation to practice, however, once we have removed the viola from its case, the desire to play the viola (well) becomes worse than useless, it creates excess tension. The harder you try the more resistance you come against. Newton gave us the gem: “For every action there is an equal and opposite reaction.” This is one of the few absolute truths in our universe. Push against a wall or table, no matter how little or great the force you exert the wall/table pushes back with exactly the same amount of force. Now imagine the amount of force you use to push down on the strings of the viola (left or right side), the harder you press the more resistance; the more energy you use beyond the required amount, the more perceived difficulty there will be in accomplishing whatever musical (or career) goals you set. This is in stark contrast to most violist’s strategy to just try harder when things aren’t going well. Essentially, you are doing what you have been doing (your habit) with more vigor and expecting a different result. Then the typical response is to get angry or depressed when it’s still not going well. If it’s not going well do less (of your habit), not more; and if that doesn’t work, change your conception of the activity (create a new habit). The desperate need to succeed in our society has led to some serious crises in learning. Goal orientation can be a major factor. If your goal is to get an orchestra job, you (hopefully) desire that goal, but constantly thinking or worrying about getting or not getting the job is destructive behavior. In Alexander Technique lingo this destructive habit is called end-gaining. Your limited mental resources become consumed by the thought of the end and there is no room left for the means. Instead think about the process, how are you going to get this job? Then you must do whatever is necessary to achieve the goal (the means whereby in AT jargon) while simultaneously giving up the desire to attain the said goal.This may sound elementary or even bizarre, but the fact of the matter is that most people are so caught up with the end goal that they don’t consider the means whereby to achieve their goals. I have many life goals and I think about them constantly, but I’m not constantly tense! Faulty perception (aka debauched kinesthesia) enables us to unknowingly carry excess tension. We have an idea in our head (a definition/belief) of what tense is. Similarly we have a idea of what “relaxed” is. The fallacy here is that tense and relaxed are places (static). Relaxed by definition implies no tension. If I had no tension I would literally fall on the ground like wet noodle. “Tense” is ambiguous. Tension comes in various amounts. Some tension is necessary for movement. This is more complex than simple semantics. Redefining what you think you already know gives you a greater understanding of the concepts. You may already be able to draw the conclusion that your perception is faulty from the above; however that is the tiny tip of a massive iceberg. Chances are that as you were reading you have crept in closer to the text without even noticing. But I wasn’t trying to keep my head back. Okay, try to keep your head back now. Do you feel your neck muscles tighten as you pull your head back? Is it excessive tension or just the amount needed to maintain your head’s (dynamic) “place” in space? If you now stop paying attention to you head/neck/back relationship (AT jargon: Primary Control) you will most likely creep toward the text again and also be completely oblivious to this. What’s your point, why have you gone off topic? My point is: now that you are aware of the behavior, you are one step closer to the ability to change the habit. In other words, your awareness level, to some degree, has been raised. Okay, so how do I combat the habit of creeping toward the text? Well, fighting the tendency, as I explained earlier, only creates more resistance. Reversing the old adage “When the going gets tough, the tough get going” reveals a more accurate depiction of reality “When the tough get going, the going gets tough.” Instead simply notice what is taking place and breathe. If you feel that your body desires to find a new position; listen to it, consider the process, and simply allow it to move. So you are saying that I am constantly carrying excess tension and I don’t even know it? Yes, most people carry so much excess tension that they can easily require five to ten times the amount of effort really needed to complete any given activity. How can this be, and how did this happen? Let’s return to the viola as a means to examine this tendency. If your left hand is overly tense, it requires more effort to lift and drop your fingers on the fingerboard. Anyone can and probably has felt this. Tense your hand and try to move your fingers, now let go of that tension and move. Excess tension restricts freedom of movement. Just as we fall into bad habits with viola technique, we also fall into bad habits in the technique of movement (in reality, they are one in the same and it is ridiculous to think otherwise; the viola is an inanimate object after all!). What lead us into these problems? Apart from end-gaining, linear thinking is another factor that gets us stuck in an endless cycle of trying. Success=good, failure=bad. Shoulder down=good, shoulder up=bad (Shoulder up=tight, down=relaxed) elbow up=good, elbow down=bad (or vice versa). You can fill in good or bad (and other associations) in the blank for any habit this way. The thing to remember is that none of those things are inherently good or bad (and they imply that the body is static which is a fallacy). We associate good/bad, tight/loose, etc. ; in ways that are often not based in reality, but instead are based on our faulty perception of reality. Your shoulder can be down and tight, you can succeed and not learn, are these good? You can fail and learn, is this bad? What are the effects of this type of thinking? Again, complete disregard for the process. No one stops to ask, “Why is xyz good or bad?” or even, “How do I accomplish xyz?” Now trying (in the form of experimentation) is surprisingly absent. Instead, the desire to get it right takes over and trying just becomes mental and muscular efforting. Remember the linear thought mentioned earlier: shoulder down=good (relaxed), shoulder up=bad (tense)? I use to subscribe to this idea, as many violists do and after/during playing my left shoulder would be down and my right shoulder was a good bit higher. For years I thought, “I’m raising my right shoulder, that’s not good.” Yet, after hours of playing it was not my right shoulder that cracked and popped, it was my left. Even after years of receiving praise for my tone (which of course comes primarily from the bow) I thought, “But my left is down so it must be better than my right,” and went about trying to lower my right for years. Needless to say I was unsuccessful. I was brainwashed to think shoulder up=bad, shoulder down=good. So just as in my own playing, when I saw this shoulder up (left or right) in my students, I would address it, telling them, “No, no, you must keep the shoulder down.” It wasn’t until years of Alexander work that I realized what I was actually doing was pulling my left arm and shoulder into my rib cage. This was the grinding bone on bone I felt in the form of constant cracking and popping. Suddenly when I looked in the mirror I saw a lop-sided version of myself I didn’t even recognize; and it wasn’t my right shoulder up, it was my left shoulder down to an extreme. Now, pause for a moment. I am not suggesting that either shoulder should be up always (also up is different than forward); instead I am suggesting that the shoulders should be free to move where they need to. This is dramatically different than the idea that, “You must keep the shoulders down!” A word of warning, because of the nature of faulty perception you can’t always trust your senses (kinesthetic feelings, vision, hearing). Like many people who suffer from anorexia, my vision was being disrupted by my faulty perception; because of this, you must have a teacher for reference. However, if the teacher suffers from faulty perception also, like in my case, brainwashing can occur. This is why it is of the utmost importance to study with a variety of the best teachers you can. Brainwashing is such a strong word; it is not as if I were in a cult! Actually, it is. We use the same methods on ourselves that cults (and religion) use to get people into an endless cycle of linear thinking; we trick our brain (perception) into thinking that “Down=good” is an absolute truth. If we believe something is true (absolutely), we are close-minded and will have a very difficult time changing. When we are in this brainwashed state, “down=good” is as universal a truth as Newton’s action/reaction. To escape this thinking, we must re-wire the brain through questioning. But, if it is true that my perception is faulty, how do I know which teachers to trust? Short answer: raise your awareness of what a good teacher is. Ask yourself: Which teachers have the best students? Which teachers teach at the best schools? Which teachers are the best players? What do they have in common? What is different? You don’t necessarily have to study with them, and they are not necessarily the best teachers; but using the pinnacles of the viola world as a reference point can be very helpful in finding a good teacher. Take lots of lessons from many different teachers. Ask about the processes of playing the viola. If the teacher can’t explain anything, he/she probably isn’t a good teacher. Form your own opinions by combining the ideas that work for you. Instead of thinking linearly, think dynamically; ponder and pontificate on probable possibilities. Try in the form of experimentation. Always keep an open mind and don’t be so sure of yourself that you are not open to the possibility of being wrong. But many great performers were/are not known for their teaching ability, does that mean there is nothing to learn from them? Anyone with an inquisitive mind, a keen eye for the body, and a “good ear” will be able to learn something from anyone, and much can be learned from mimicking. However, faulty perception can blur what the teacher is actually doing into what you think they are doing. Because what the teacher is doing is being filtered through your mind and body (through the eyes and ears, into the brain etc. ), it stops being what the teacher is doing and becomes your interpretation of what the teacher is doing. This problem can be further compounded if the teacher doesn’t know (or has faulty perception of) what he/she is actually doing. Think about the times you’ve misunderstood what your teacher was doing. If the teacher is skilled and has an eye for this, she/he first informs you that you have misconstrued the concept and then demonstrates or explains the difference between what he/she is actually doing and what you are doing (raising your awareness of reality). Conversely, if the teacher has faulty perception she/he is most likely interpreting what you are doing incorrectly. 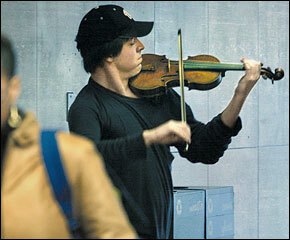 For example, no viola teacher ever told me that I was pulling my left shoulder into my chest. They (I’m assuming) were all caught up in the fallacy down=good, up=bad; it simply is not that simple. We tend to idolize our teachers to the point that they can do/say no wrong (whatever they say is true). This is not the case. They, like us, are human; and no human is perfect. If we forget this, we open ourselves to brainwashing. How do I stop these tendencies? There are many methods that can help, but the first step is to take an inquisitive stance toward learning (AT lingo: right mental attitude). Stop trying to answer questions you don’t know the answer to with knowledge you already have. Don’t think linearly (cause & effect) think dynamically (many possibilities). Again, learning requires an expedition into the mysterious, so don’t be afraid of the unknown. Don’t pretend you already know the answer if you don’t, you are only cheating yourself out of learning with this behavior. Don’t jump to conclusions, wait for them come to you. Inhibit the desire to be right and don’t be afraid of being wrong. If you don’t understand something, ask how (and then maybe why? [in that order]). It is interesting that why is the last of the “five W’s of writing” (who, what, when, where, why). Thinking about why often puts us in a state of paralysis, sometimes referred to as the “paralysis of analysis.” Try to use why as a last resort and connect why to how. I am not suggesting that why is useless or unimportant, however it can be very helpful to temporarily forget about why. Asking the question, “Why is my bow path crooked?” is a helpful first step in changing the habit, in that you are now aware of the habit. Essentially you are actually asking, “How can I straighten my bow path? But, once you have begun to perform, in the practice room or the concert hall, thinking, “Why is my bow path crooked?” is a nothing but a distraction. Taking personal responsibility for what you are doing is an important component. A more useful (and more realistic) version of the question “Why is my bow path crooked?” is “What am I doing to make my bow path crooked?” Going back to the five W’s, try asking: Who do you want to be? What do you want to do? When do you want to do it? Where do you want to do it? How are you going to do it? Then, maybe, why do you want to do it? To get the right answers (the answers you are looking for) you must ask the right questions. Similar to the idea that you must temporarily give up the desire to achieve your goals to better attain them, you must temporarily forget about why you are learning a task while learning that task. The task you are trying to learn (how to play the viola) requires so much concentration that your brain simply doesn’t have enough processing power to think about both the question and the process. Contrary to common belief, playing the viola is no joke. This is why you only feel the quasi-out-of-body experience when performing well rehearsed music. In this state, there is less interference between the mind and body, energy flows freely through the body, and the running commentary in your head disappears. Some have described a feeling of no longer existing when in this “flow” state. This is why there can be no ego for real music to occur. 1) You must have the piece well prepared, meaning you have not practiced in mistakes and stops. The old rule of practicing a shift or phrase one-hundred times correctly in a row to have it learned is excessive, but you must hit the notes more often than not if you ever hope to achieve flow. Go slowly enough that you don’t lose the feeling of your head/neck/back relationship (primary control). Think of what feels like a slow tempo and play half that speed. This is how your body learns the fastest. Pay attention (raise your awareness) to what your body is doing (unconsciously) and what you are doing to your body (consciously); give yourself gentle direction(s) (AT lingo: for mental intention/conception without physically trying to do the thought). 2) Quiet the voice in your head. Practice meditation, the Alexander technique, or anything that works for you. There are many methods and books focused on this topic. 4) Finally, play for people you care about; nerves are the aspect of flow that we cannot control. I cannot stress the importance of performance practice enough. The time to learn how to go in and out of flow is not during the performance. Why are these ideas not taught at music schools? Some schools do offer one semester group Alexander class, which is the first baby step in addressing the problem. However, many schools offer nothing in the way of body education. My alma mater, the University of North Carolina School of the Arts, only offered a one day a year Feldenkrias and/or AT workshop that was completely arranged by the viola professor and not even funded by the school. The state of the university education is utterly disgraceful and I am ashamed and appalled by student’s (and teacher’s) general lack of interest in learning as well as the selling Degrees for profit model that most school’s administrations have adopted. I was completely ripped of my inspiration (and propelled into major depression multiple times) by lack of opportunity for learning and excess busy work at one of these so-called “learning institutions.” The idea that you must attend a “learning institution” to learn is ridiculous, elitist, and must be disregarded if we really wish to improve education in our time. It took a year of relative solitude and the Alexander Technique for me to rehabilitate my childlike love for music. In your opinion, what was the problem? We must remember that school does not give you an education. Leaning is not inherent in the ivory towers of our “learning institutions.” From my experiences it would appear that music schooling will be especially torturous if your real goal is to learn as opposed to getting a degree or diploma. Real musician’s music is embodied fully, it does not solely reside inside their heads. There are many incredibly gifted players that are not considered great musicians these days. I think that this is most likely because they approach their instrument in a theoretical, mechanical, and technical way; which is required to gain proficiency on the instrument, but then they get stuck there (in that habit) and approach music making in the same theoretical, mechanical, and technical way. It’s not a science as much as the universities have tried to make it one. Like wolves in sheep’s clothing, academics (who are mostly failed performers themselves), have infiltrated the music world and spread the plague of forcing years of advanced theory and piano down our throats (to the point that the pure childlike joy of music can be, at least temporarily, lost). Also musical-academics tend to go on to be administers, further deepening the requirement of such courses. The loss of connection to the body and soul is how “higher” education has become more about a track than real learning. This is why I came to the conclusion that I need “music school” about as much as I need a hole in the head if my real goal is to become a great violist. The worst case where the musical technicians/academics went wrong was compartmentalization. They try to educate your brain solely, rather than taking a holistic approach to educating the body, mind, and soul. This is why you must educate yourself to educate your self. You talk a lot about being childlike, are you trying to become/make “adult-child prodigies?” While I am not advocating becoming a man-child, yes. If we become childlike we can become like a child prodigy. There is an idea floating around the music world that once you leave your teenage years you either stop learning or learning is significantly slowed. Why do so many musicians (and people in general) experience and believe this? What causes us to lose the ease of learning, a skill that all of us once had, and why is it thought to be a natural process? When we were children, the mind and body worked in conjunction to learn. Both were completely blank slates when we were babies, and as we learned to walk and talk, instinctively, we educated ourselves wholly. Contrast that with the nearly universally accepted idea that to learn you are solely “feeding your head.” It is when we stop playing with our bodies that learning slows and dies. We are missing an essential part of the puzzle. Think about when you lost the desire to go outside and play (to experience the pure joy of motion). A life without motion is a life without joy. But I walk/run/go to the gym all the time, surely this doesn’t apply to me. When we stop trying in the form of experimentation and faultily perceive that we know how to use our bodies, we open ourselves to habit. Exactly in the same way, when we stop experimenting on the viola, we stop learning and open ourselves to habit. Really interesting article John. I know absolutely nothing about Alexander technique but I think your thoughts here are tremendously insightful. Definitely will be encouraging some people to visit your blog.